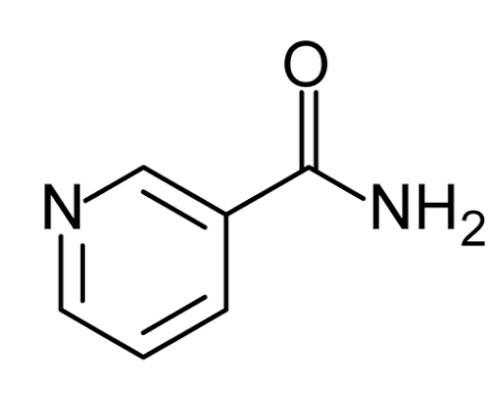 Vitamin B3, also known as niacin, is a vitamin that is a useful precursor for nicatinamide adenide dinucleotide (NAD), which is an important energy source in many metabolic processes. Vitamin B3 bears the structure of a pyridine ring with a carboxyl group at the 3' carbon. Vitamin B3 is typically synthesized from the amino acid tryptophan. While many clinical trials have successfully shown that vitamin B3 can help to improve memory and attention in those with cognitive decline, there is limited evidence that shows vitamin B3 has enhancement effects in the normal human population. It is recommended that receive up to 14 mg/day (females) to 16 mg/day (males) of vitamin B3. In general, meats have the highest amount of vitamin B3. For example, a 75g serving of tuna contains 12 to 18 mg vitamin B3. A 75 g serving of red meat such as pork or beef has roughly 6 to 14 mg of vitamin B3. In grains, a slice of bread has about 2 mg of vitamin B3 while a cup of oatmeal contains roughly 4-6 mg of vitamin B3. Vitamin B3 Vitamin B3 is classified as a Generally Regarded as Safe compound by the FDA. Vitamin B3 is essential to health of the nervous system and digestive system, and there are no major side effects when consumed within safe quantities. While there is limited research showing that vitamin B3 can significantly enhance cognitive performance, it is still important to consume an adequate amount of vitamin B3 each day. While typically you can get enough vitamin B3 through food, you may wish to supplement your diet with up to 16 mg /day (males) or 14 mg/day (females). Morris, M. C., Evans, D. A., Bienias, J. L., Scherr, P. A., Tangney, C. C., Hebert, L. E., ... & Aggarwal, N. (2004). Dietary niacin and the risk of incident Alzheimer’s disease and of cognitive decline. Journal of Neurology, Neurosurgery & Psychiatry, 75(8), 1093-1099. Singh, R. L., Vishwakarma, S. P., & Singh, P. (2014). 19 Vitamins and Minerals: Roles and Plant Sources. Phytochemicals of Nutraceutical Importance, 310. Capuzzi, D. M., Morgan, J. M., Brusco Jr, O. A., & Intenzo, C. M. (2000). Niacin dosing: relationship to benefits and adverse effects. Current atherosclerosis reports, 2(1), 64-71.